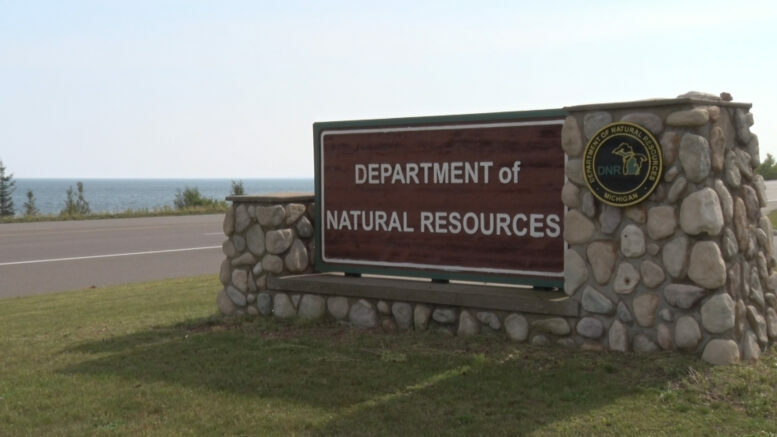 HOUGHTON COUNTY — Final approvals were recently granted by government regulatory agencies for a dredging project set to begin this summer at the Grand Traverse Bay Harbor in Houghton County, according to a press release from the Michigan Department of Natural Resources. The stamp sands were created in the early 1900s as a byproduct of copper processing at the Wolverine and Mohawk stamp mills in the community of Gay in Keweenaw County. Since that time, these coarse, black sands, which were dumped into Lake Superior, have drifted south and are now threatening to cover Buffalo Reef and natural beaches south of the Grand Traverse Bay Harbor. Over the past roughly 80 years, the stamp sands have moved south – transported by winds, waves and nearshore lake currents – about 5 miles to the Grand Traverse Bay Harbor, covering 1,426 acres of shoreline and lake bottom. Under the permit, a total of 172,500 cubic yards of stamp sands are expected to be removed from an underwater bedrock trough, moving the sand to a 37-acre placement site that has the capacity to store 380,000 cubic yards. This 2,350-foot-long by 700-foot placement area, located about 1.5 miles from the dredge location, would be north of Buffalo Reef, behind a temporary berm. Bids are expected to be solicited soon, with a contract awarded in late spring. The EPA has formed a cooperative multi-entity task force to develop that plan over the next couple of years, which will solicit input from many stakeholders, including the public. The stamp sands source pile at Gay was originally estimated to contain 22 million cubic yards of material, with 2.3 million cubic yards of material remaining today. 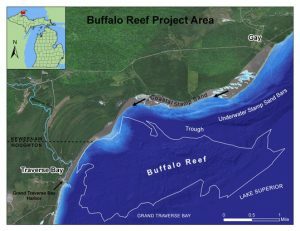 A map of the Buffalo Reef project area can be seen below. A color map showing the Buffalo Reef project area, with the stamp sands, Buffalo Reef, trough and other points of interest detailed.